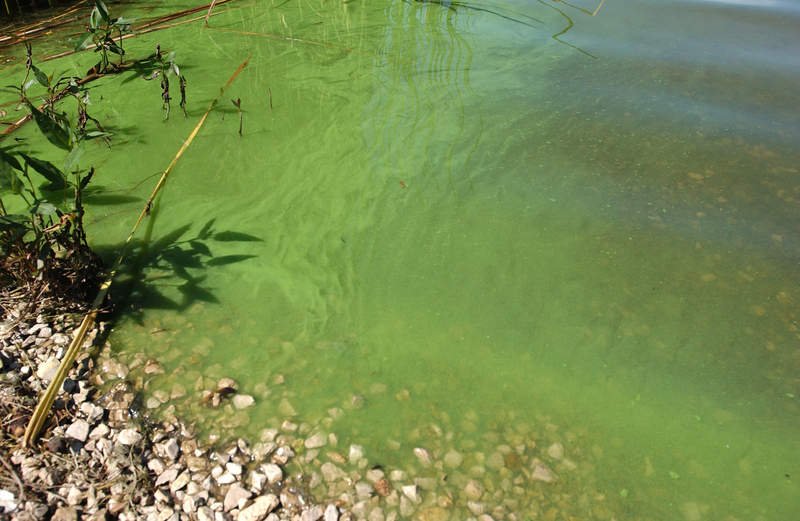 Harmful algal blooms (HABs) are concentrated growths of cyanobacteria. They are commonly called blue-green algae, but they are really bacteria, a more primitive life form than algae. Blue-green algae are one of the earliest forms of life on earth. They have been around for about 500 million years. They are a very diverse group of organisms, and there are many different species. They are present in water everywhere, both fresh water and sea water, but usually in low concentrations. Some species produce toxins and some do not. The toxins themselves are very diverse and can have a variety of health effects. Depending on the species of blue-green algae and the type of toxin it produces, contact with high concentrations in blooms could result in skin rashes while ingestion could result in fatal liver toxicity. An algal bloom consists of a concentrated growth of any species of algae or cyanobacteria in a water body. A bloom can be a small patch of algae or it can cover many acres of water. Nobody really understands what triggers a population of any species of algae or blue-green algae to suddenly proliferate into a bloom. Phosphorus and nitrogen nutrients are thought to play a role, but there are almost certainly other factors at work, as well. Many algal blooms are what are referred to as Nuisance Algal Blooms, or NABs, because they do not produce toxins and do not present a health risk. Blooms of blue-green algae (cyanobacteria) may or may not produce toxins, depending on the species. It is best to avoid contact with any algal bloom that looks like it might be caused by cyanobacteria, because it could be a toxin-producing species that presents a health risk. Harmful algal blooms generally have a distinctive appearance. The NYSDEC and NYSDOH maintain excellent websites on HABs that you can use to learn what HABs look like and how to report a bloom that you think is suspicious. Once you report a suspicious bloom, including photos, if possible, NYSDEC and/or NYSDOH will evaluate the evidence you provide and send somebody out to collect a sample if they agree it could be a HAB. Some lakes take part in a volunteer HABs surveillance program that is operated by the NYSDEC (www.dec.ny.gov/chemical/77118). The Cayuga Lake Watershed Network, the Community Science Institute and others are in the process of organizing a volunteer HABs surveillance program for Cayuga Lake. If you are interested in participating, please contact Claire Weston, Outreach Coordinator at the Community Science Institute, at claire.weston@communiyscience.org, or Hilary Lambert, the Cayuga Lake Watershed Steward, at steward@cayugalake.org. Harmful Algae Blooms (HABs) have been reported on the Cayuga Lake shoreline since mid-July 2017. They may persist until cold weather arrives. Read the information below and watch for updates. Find out what HABs are, why they are dangerous, what they look like, who to contact if you think you have found one, and who to contact to find out if your favorite beach is closed, and when it might re-open. Click on link http://www.dec.ny.gov/chemical/77118.html to learn what a Harmful Algae Bloom (HAB) is, what causes it, and why you should STAY AWAY from them. Pets and kids too!! Click on link to the website www.health.ny.gov/harmfulalgae . It provides advice to avoid contact with blue-green algae blooms and information for people who may have been exposed. If you experience health symptoms, we recommend that you consider discussing these with your health care provider. If you believe your symptoms are associated with exposure to a HAB, please report them to your local health department (www.health.ny.gov/EnvironmentalContacts ) or NYS DOH (harmfulalgae@health.ny.gov ). If you suspect that you have seen a HAB, please report the bloom to the NYS DEC. Fill out and submit a Suspicious Algal Bloom Report Form. Email the completed form and, if possible, attach digital photos (close-up and landscape to show extent and location) of the suspected bloom, to HABsInfo@dec.ny.gov. Please report any health symptoms to NYS Health Department at harmfulalgae@health.ny.gov and your local health department.Please report any health symptoms to NYS Health Department at harmfulalgae@health.ny.gov and your local health department. People, pets and livestock should avoid contact with any floating mats, scums, or discolored water. Colors can include shades of green, blue-green, yellow, brown or red. Never drink, prepare food, cook or make ice with untreated surface water, whether or not algae blooms are present. In addition to toxins, untreated surface water may contain bacteria, parasites or viruses that could cause illness if consumed. People not on public water supplies should not drink surface water during an algal bloom, even if it is treated, because in-home treatments such as boiling, disinfecting water with chlorine or ultraviolet (UV), and water filtration units do not protect people from HABs toxins. Where have HABs been found on Cayuga Lake this summer? Since mid-July, HABs have been reported at the Village of Aurora swimming beach, Frontenac Park in Union Springs, Taughannock Falls State Park, Myers Park, and several other locations on both the east and west shorelines. Some of these are “potential” HABs, being observed carefully, and we advise you to not use these sites until the threat has vanished. These sites are all posted with warning signs by the county health departments. The NYS DEC updates their statewide list of HABs each week, but these lists are not detailed:http://www.dec.ny.gov/chemical/83310.htmlWe – the Cayuga Lake Watershed Network, Community Science Institute, NYS DEC, Floating Classroom, county health departments, municipalities – will try to provide you with an updated list once or twice a week. You may want to call your local township or village office in advance of going swimming at a favorite spot. We will be organizing volunteer monitoring and reporting teams around the lake. Contact steward@cayugalake.org or claire.weston@communityscience.org to get involved.